So far, sixth grade is turning out to be not such a great year for Merci. A scholarship student at Seaward Pines Academy in Florida, she didn’t go on any fancy vacations over the summer like her classmates, instead hanging out at the beach with her family, practicing her soccer moves, and baby-sitting her wild twin cousins. Bossy queen bee Edna is her same old self – using her weird ability to make everyone follow her lead to leave Merci behind. None of the girls wants to play soccer anymore – too sweaty, and their hair might get messed up. And Miss McDaniels in the office has signed Merci up for the Sunshine Buddies, a program for new kids at school to have someone to help them get settled – and paired her with a boy. From Minnesota. Who is as tall as a moose and pale as a vampire. Even worse? All of Edna’s opinions about Merci’s Sunshine Buddy. On top of all of that school stuff, Lolo, Merci’s grandpa, who she can always count on to understand about things and help her feel better about being herself, is acting strangely – forgetting stuff, mixing up the twins, getting lost, and even falling off his bike on their weekly trip to her aunt’s bakery for Sunday dinner bread and cookies. Merci is worried, but no one will tell her what’s going on. At least she still has soccer games with Papi, and tryouts for the school team coming up, plus helping Papi and Lolo out with paint jobs on the weekend for their family business. And she’s in Ms. Tannenbaum’s class this year, which means building an Egyptian tomb in the classroom, including a mummy. But as stuff with Lolo gets more confusing – and scary – and Edna ramps up her anti-Merci agenda, sixth grade goes from bad to worse. How is one kid supposed to deal with all this change she never even asked for in the first place? I absolutely loved this year’s Newbery winner! 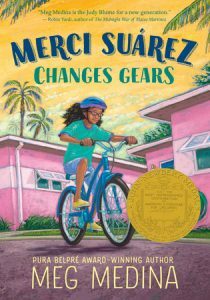 Merci Suárez Changes Gears is that fabulous middle grade novel that perfectly captures a year in transition. Change is always hard, whether we choose it or not, and I loved cheering for Merci and her family as she starts to figure herself out. With a marvelous sense of place, family worries, celebrations, fights, and plenty of love, and all the trials and rewards of beginning to discover who your true self and your true friends are, this is one I’d recommend for kid and adult readers alike. Meg Medina has also written some stellar, award-winning, and super powerful YA fiction, so I’m happy to see she’s just as much of a powerhouse in the middle grade field. Don’t miss this book, especially now that it has a shiny gold medal on the cover! Young mouse Pete has a mystery to solve, and he knows just who to ask for help – the Professor at the University of Mice. Pete’s many-greats-grandfather boarded a ship to cross the Atlantic with a mysterious treasure generations ago, and was never heard from again. He left no trace behind – only an ancient piece of paper that tells the tale of a sea voyage and a great treasure. With the help of a little research and a magnifying glass, Pete and the Professor discover that the ship, the H.M.S. Atlantis, went down in a tragic accident. All the human passengers were saved – bit what became of the mice, and all their belongings? With that, Pete is off on a great scientific quest – to find a way to get to the bottom of the ocean and search the wreck of the Atlantis for his family treasure. But can the two mice find a way to build an underwater submersible that will take them to the ocean floor, allow them to explore the deepest depths, evade the sea’s largest and most terrifying creatures, and make it safely back home again? With a little ingenuity and a lot of scientific perseverance, Pete and the Professor are sure to find a way. 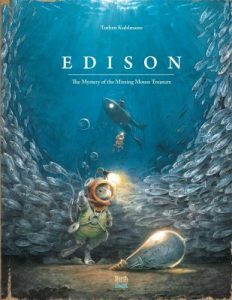 The third in Torben Kuhlmann’s marvelous series of books celebrating exploration and innovation, Edison is the perfect mix of history, the science of invention, the thrill of exploration, and, of course, mice making their way in a human world. Gorgeously detailed illustrations reveal the wonder and beauty of the world through the eyes of small, clever creatures, making this hybrid picture/chapter book an adventure story perfect for all ages. Shared aloud or pored over on your own, no matter how old you are, make sure you explore a little bit of mouse history with Pete and the Professor this spring. And, once you’ve hunted for treasure with Pete for awhile, make sure you take a trip to the skies in Lindbergh, and then even further to the moon with Armstrong! A Fine Dessert History Story Time! Join Miss Megan and Lindsey from the Goodhue County Historical Society for a fun-filled history story time on Friday, December 28 and 10:30 AM! 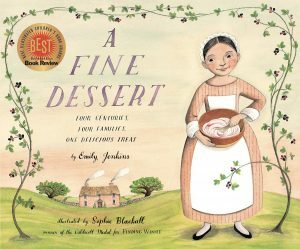 We’ll read the marvelous A Fine Dessert: Four Centuries, Four Families, One Delicious Treat written by Emily Jenkins and illustrated by Sophie Blackall, and then Lindsey will treat us to a look at some historical kitchen appliances (have you ever tried to whip cream with a twig whisk? Me either!). And then, my favorite part – we’ll do a little whisking ourselves and create yummy homemade whipped cream! Not to worry, we’ll also have non-dairy whipped cream on hand so kiddos who are dairy-free will be able to enjoy the fun of whipping cream and tasting some of our sweet treat. Books and treats – what could be a better way to wrap up the year? Registration for this program is recommended so we can be sure to have enough cream on hand – call or stop by the library to sign your kiddos up. Program attendance is limited to 24 children.